To mark the 40th anniversary of the UK release of director Nicolas Roeg’s iconic science fiction odyssey, The Man Who Fell to Earth, STUDIOCANAL is thrilled to announce that they are near to completing a new 4k restoration of the cult classic. The restoration has been in the works since late 2015, but is now especially timely and poignant given the news of David Bowie’s death earlier this year. The film will be released in cinemas nationwide on 9th September by Park Circus and then as a Collector's Edition, Blu-Ray, DVD or Download from 10thOctober by STUDIOCANAL, complete with brand new bonus material and special packaging, as part of their Vintage Classics range. 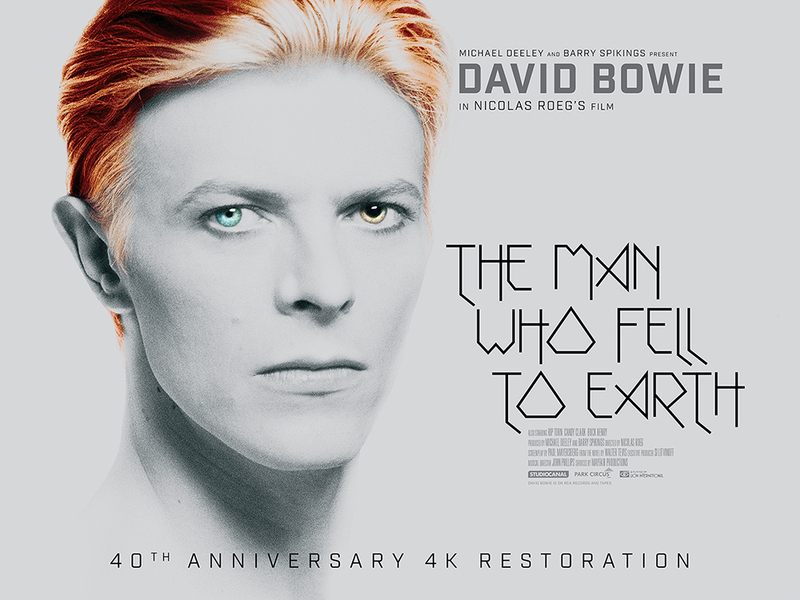 Restored by Deluxe London, the restoration of The Man Who Fell to Earth is based on a 4K scan of the original camera negative, followed by a full 4K workflow, with the approval of cinematographer Anthony Richmond. 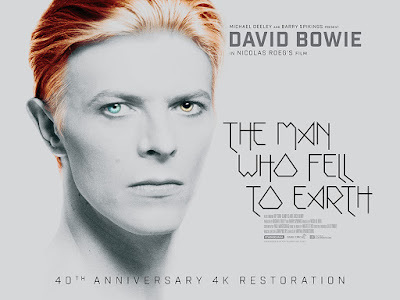 Featuring a startling and era defining lead performance from David Bowie (The Prestige, Labyrinth) in his debut feature role and based on the cult novel byWalter Tevis, The Man Who Fell to Earth endures as, not only a bitingly caustic indictment of the modern world but, also, a poignant commentary on the loneliness of the outsider. Thomas Jerome Newton (David Bowie) is a humanoid alien who comes to Earth from a distant planet on a mission to take water back to his home planet in the midst of a catastrophic drought. Using the advanced technology of his home planet to patent many inventions on Earth, Newton, aided by leading patent attorney Oliver Farnsworth (Buck Henry, The Graduate, Get Smart), acquires incredible wealth as the head of a technology-based conglomerate that he intends to use to finance the construction of a space vehicle to ship water back to his planet. Newton embarks on a relationship with hotel maid Mary-Lou (Candy Clark, American Graffiti, Zodiac) and makes progress with the construction of his vehicle but soon finds his true identity at risk via his roguish colleague and confidant Dr. Nathan Bryce (Rip Torn, Men in Black, Marie Antoinette) who threatens not only his relationship with Mary-Lou, but his freedom and chances of making it home to the family he yearns for. David Bowie was originally due to record the soundtrack but Nicolas Roeg decided the direction he was going in didn’t fit the film and, so, hired The Mamas & The Papas’ John Phillips instead. Rumour has it that the tracks Bowie wrote for the film formed the basis of his albums STATION TO STATIONand LOW, both recorded in the years after the film’s release and featuring stills from The Man Who Fell to Earth as their covers. Director Nicolas Roeg began his career in film as a camera operator before progressing to the role of cinematographer on films including Roger Corman's The Masque of the Red Death, François Truffaut's Fahrenheit 451and John Schlesinger’s Far From the Madding Crowd. Having moved to directing with 1970’s Performance, Roeg went on to helm an extraordinary run of films over the next decade that included Walkabout, Don’t Look Now andThe Man Who Fell to Earth. Since then, Nicolas Roeg has enjoyed a long and highly acclaimed career, inspiring many of today’s filmmakers from Danny Boyle to Ben Wheatley and picking up numerous awards and accolades including a BFI Fellowship in 1994.